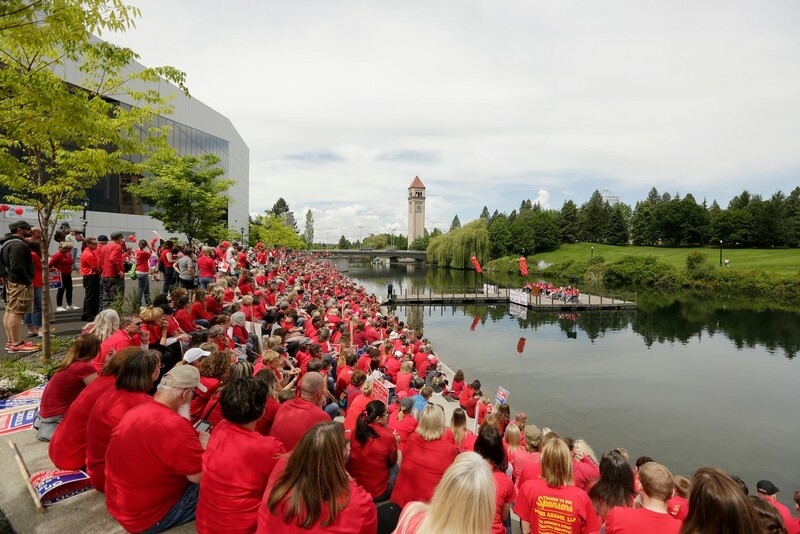 Over a thousand teachers, school staffers, and community members gathered near the floating stage at Riverfront Park today, dressed in red and protesting a whole slew of frustrations. Most teachers were from the Spokane Public Schools and East Valley, though some teachers from other districts — like Central Valley — took a personal day to join the protest. Instead of focusing on one decision or policy, the union kept things wide open: Many of the signs they carried had a clock with the caption "IT'S TIME ______." And teachers, in permanent marker, filled in the blank: "To Full Fund Education," "To Lower Class Sizes," "For the legislature to do their job," "For competitive salaries and benefits." While both houses of the legislature plan to increase education funding this year, and give teachers a modest cost-of-living increase, over 60 districts statewide have walked out anyway. "On STRIKE against the Legislature. - Get 11 percent raise?" For teachers, who have been waiting six years for a raise, it's easy to see why that last point could stick in their craw. But is it true? Bonnie Banicki, a second grade teacher from Balboa, shares her frustation with the legislature. As a simple figure, yes. The legislators are due to receive an 11.2 percent raise. Their salaries will increase to $46,839 by September of 2016. First of all, the legislature did not vote to give themselves a raise, like it might sound. In fact, that would be the Washington Citizens’ Commission on Salaries for Elected Officials. The group was set up to remove the political aspect from wage increases for politicians. Other protest signs tend to make that a little bit more clear: "17 people voted for legislator's 11.2" read a sign carried by Bonnie Banicki, a second grade teacher at Balboa Elementary. 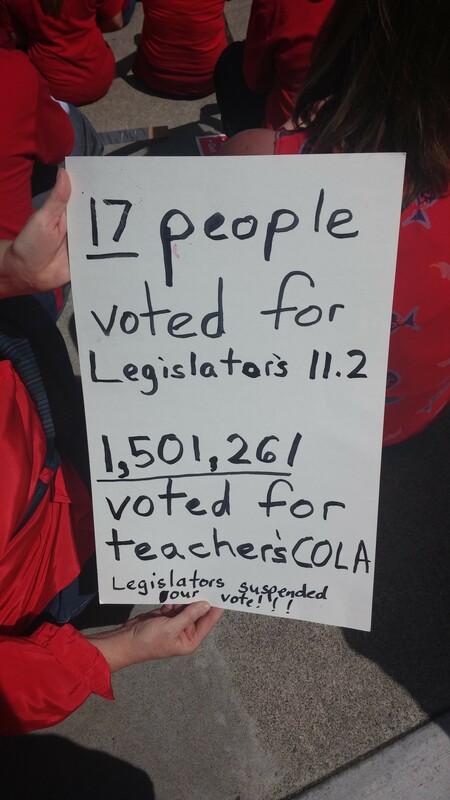 "1,501,261 voted for teacher's [Cost of Living Increase]. Legislators suspended your vote!!!" She's referencing Initiative 732, passed by the legislature 15 years ago. The legislature overwhelmingly suspended that initiative in 2011, due to a major budget crunch. But the first figure is inaccurate: Only 10 members of the salary commission voted to increase legislator salaries, while five voted against it. The signs also ignore the fact that legislators, like teachers, haven't received a raise since 2008. And like legislators, teachers are scheduled to receive a pay increase. As a percentage, the increase for teacher isn't quite as impressive, however. The Democrats in the House have proposed a 4.8 increase over the next biennium, a little higher than their cost of living will increase over those two years. The Republicans in the Senate proposal, a 3 percent increase over the next biennium, is more modest. Yet, even if their teacher salaries didn't increase at all, the average teacher salary in Washington— $52,969 — would still be higher than legislator salaries in 2016. Of course, legislators only work part of the year, and get an extra stipend. And so do some teachers. That's a weakness with comparing teaching to legislating — or teaching to doing anything else. Teachers have a unique set of advantages and disadvantages to their job, including the perks of vacations, job security, and job satisfaction, and the disadvantages of waking up early and spending long nights grading terribly written student essays. 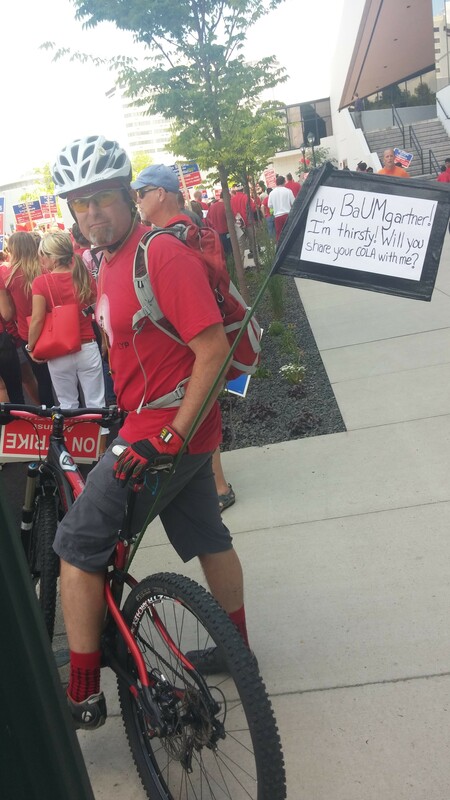 That's one reason why teachers were also carrying signs calling for lower class sizes and reduced time spent testing. It's not just the pay that makes a job feel worthwhile. It's the experience. Read more about the teacher strike here. See photographer Young Kwak's slideshow of the rally here. Bands to Watch: Where are they now? Why is everyone disappointed in the new budget’s education allocation?